← guaranteed to strike horror into the heart of any knitter. I think maybe we all have some love for the Noro and if you’re like me, you cannot really afford to fully indulge your love of this fab yarnage. I mean, I can get a skein, sure. But what can you make with a SKEIN? Well, a One Skein Wonder from Glampyre maybe (though with Noro, I’m thinkin possibly that’d take a skein and a half or so) and the obvious, a hat. I’ve seen a couple of Noro hat patterns floating around, all designed to take advantage of the One Skein Is All I Can Afford issue. Here’s the one I sortof adapted for myself last winter…. My pattern gives you a nice loose fabric and there really is no gauge required, just preference. I live in LA. To paraphrase Crazy Aunt Purl, who is quite possibly the funniest knitter/writer/wine drinker/cat lady EVAR? When it gets cold here, the trendanistas put on 8′ long skinny scarves over their tank tops and maybe shift to Ugg boots with their teensy skirts. Bwah! She slays me. Is also pathetically true. You will want to use smaller needles with Silk Garden or it won’t fit right. With Iro and Kureyon, there seems to be more elasticity and a slightly more snug fit. If you live in a cold place and warmth is really an issue, consider using the Iro on a #10 needle. Otherwise, pass me a cold drink with an umbrella in it and my mittens, please. cast approx 80 stitches give or take. You can adjust it up or down a little depending on desired fit. You’ll be working a K2P2 rib. 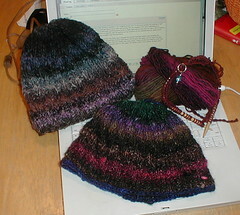 Basically, every 3 rows, just move the ribbing over one stitch and as the hat grows, you get a spiral ribbed hat. When you have approx. 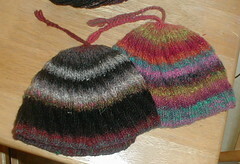 6″ of hat on the needles in spiral rib or however much you need for your noggin, go on and start your decreases. break yarn with a tail, thread through remaining stitches, tie off or braid and you can have a little braided tasselly thing. I suppose if you wanted earflaps annd had extra yarn, you could pick up stitches on either side and make those but here in LA, who needs earflaps? This is a great pattern for Noro yarn and the spiral ribbing shows off the self striping patterns beautifully. I’ve made a ginormous amount of these hats and they are always quickly snatched up by someone. Like, my teenager who has a stash of them in various colorways. When I give them as gifts, they are very well received. Plus? Noro. Who can afford a ton of Noro? I can’t. This allows me to use wonderful yarn, enjoy the process and I get the joy of giving something utterly luxe, yet stay on a budget when gifting. HI, thanks for posting this pattern. I’m a little confused around the decreaseing part. When I get to the decrease round do I purl the purls and knit the knits except for the k2 tog every 4 stitches? Or do I move to k1 p1? Krista, I decrease in pattern, so purl the purls and knit the knits. The way it is set up, it generally works out so that when you are K2tog, both will either be a two knit or two purl together. You might have to fudge a stitch or two, but you can get a nice ‘in pattern’ decrease section doing it that way. Once you get to K2tog after every stitch, just switch to knit every stitch.